The decision engine executes a decision determination algorithm specified by an analyst. In particular, I pointed out that one of the most typical complexities of decision modeling is exception handling when an decision analyst is trying to cover all possible situations using rules with multiple exceptions. While exceptions usually occur in less than 10% of real-world cases, exception handling takes more than 90% of decision modeling efforts. The necessity to represent multiple exceptions on top of other exceptions is frequently caused by the fact that decision modelers are trying to represent the existing (!) business logic. Such decisioning logic was defined before decisions were automated and when decision makers were doomed to follow some deterministic, frequently greedy algorithms. However, if we try to find out the actual reasons for exceptions, we may discover business rules that were hidden in minds of subject matter experts (Ron Ross calls them “tacit rules”). When it is practically impossible to cover all possible situations (various combinations of decision factors), decision modelers take shortcuts that lead to decisions which are far from optimal. 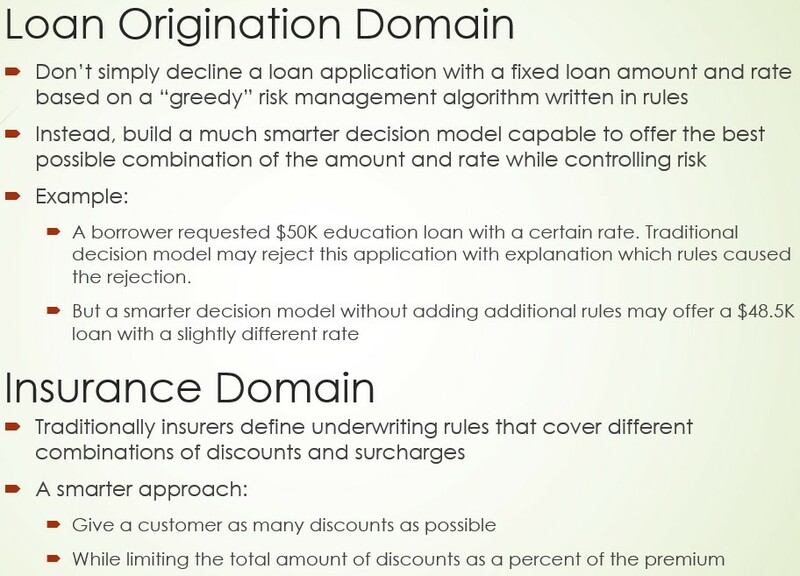 This is one of 20 decision models submitted as solutions for the DMCommunity.org Jan-2016 Challenge, and they all used the “method-based” approach. Note that the 3rd row in the above decision table “CalculateVacationDays” implements this rule: “Give extra 2 days only if you you haven’t already gave extra 5 days“. Why extra 2 days cannot be combined with extra 5 days? Probably, the real reason for this rule was to limit a total number of vacation days while giving as many as possible extra days, which this employee is eligible to. Adding more extra days eligibility conditions may create a real mess if we continue to use the method-based approach and will try to compare different eligibility criteria with each other. Every employee receives at least 22 vacation days. Employees younger than 18 or at least 60 years, or employees with at least 30 years of service can receive extra 5 days. If an employee has at least 15 but less than 30 years of service, extra 2 days can be given. These 2 days can also be provided for employees of age 45 or more. A college student is eligible to 1 extra vacation day. If an employee is a veteran, 2 extra days can be given. The total number of vacation days cannot exceed 29. If this number exceeds 29, assign 29 to the total number of vacation days. However, it would mean that we are allowed to subtract days from some eligible days (without even knowing from which one) and to give only a partial number of eligible days. What if it’s not allowed? Consider a benefit management system with hundreds of possible benefit types (similar to vacation days) when some benefit types are mutually exclusive. The benefits could have associated values but they could not be given “partially” (everything or nothing). The method-based approach would not work in these cases, especially if you want to maximize the total value of all given benefits while providing some limitations (such as a percent of the total value). In this model, all eligibility rules still can be represented using business-friendly decision tables such as 3 tables on the right of Fig. 1. However, we don’t need any more a summary table “CalculateVacationDays” with inter-rules relationships. 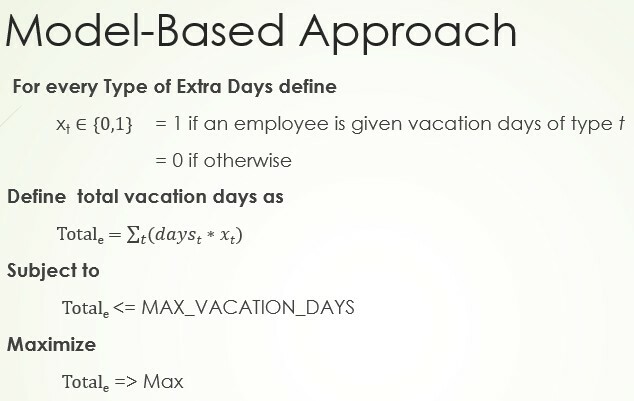 Instead, we introduced unknown decision variables Xt to define if an employee will receive vacation days of the type “t” or not. 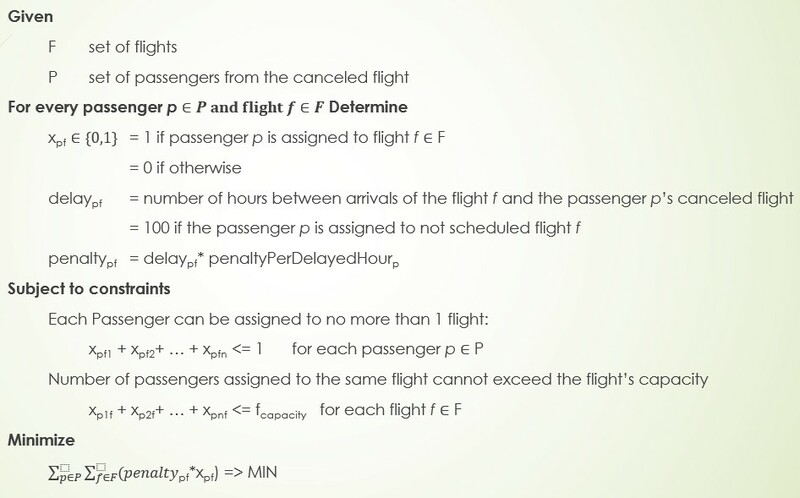 These variables are defined for every vacation days type including basic. Using these variables we can define the objective as a sum of all vacation days multiplied by these proper Xt variable. We also can limit this sum by some number MAX_VACATION_DAYS, e.g. 29. Then we can ask a decision engine to maximize this sum. 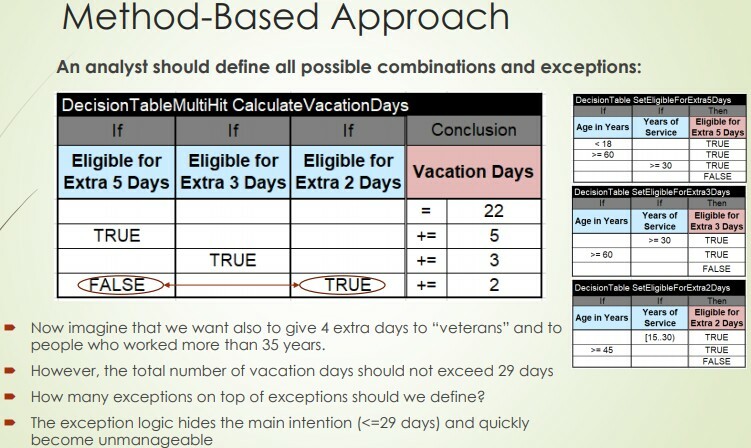 If we want to allow using partial numbers of vacation days for different types, instead of using as integers, we may define them as integer variables, which take values from 0 to a number of days for the type t.
This approach not only eliminates all rules about relationships between different types of vacation days. It also replaces a one “greedy” path to solution with an ability to find a true optimal solution. I understand that the use of mathematical notation may scare business users, and we need to find a user-friendly way to represent this model using a particular decision modeling tool. However, at least we should make sure that a business user is aware that our decision engines could handle this and much more complex modeling approaches (constraint and linear engines successfully do it for decades!). I submitted two different representations of this model in response to the Nov-2018 Challenge. They both use OpenRules and JSR-331: the first solution has the business part defined in Excel and the optimization part defined in Java; the second solution is an attempt to define both parts directly in Excel (without Java). A flight was cancelled and we need to re-book passengers to other flights considering their frequent flyer status, miles, and seat availability. How the re-booking logic can be represented in an executable decision model? This is certainly a “greedy” algorithm (or a heuristic) that will produce a decision, but we would never know if this decision is the optimal one. So, it unnecessary could leave some passengers very upset. 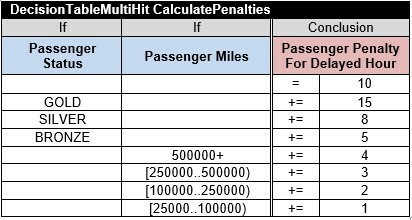 In this model we introduced new decision variables “Passenger Penalty For Delayed Hour” one for each passenger, and we want to minimize the total penalties while assigning passengers to flights. A number of passengers assigned to the same flight cannot exceed the flight capacity. A business analyst will be able to adjust penalties in the decision table in Fig. 5 and the same model will produce different optimal decisions. Of course, to implement this decision model we need a much more sophisticated decision engine that is usually used by the majority of rule engines including those that support DMN. I implemented this decision model using a combination of OpenRules and JSR-331: I will publish its description soon. Certainly, the model-based approach will make decision modeling in these domains much more powerful, and may address problems which previously were out of reach for traditional rule engines. 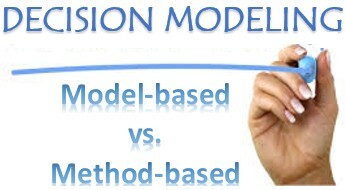 In conclusion, I want to stress that there are many possible implementations for the model-based approach: I plan to describe some of them in another article. This is work in progress that requires additional research and practical implementation for various decision modeling problems. Hopefully, more people will join these efforts.